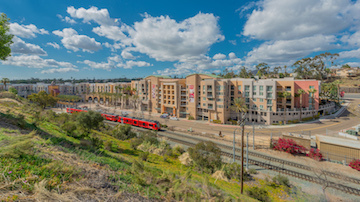 SAN DIEGO - Aug. 8, 2018 - PRLog -- TruAmerica Multifamily in partnership with Intercontinental Real Estate Corporation ("Intercontinental") has acquired the leasehold interest in the largest transit-oriented development in San Diego County, the 527-unit Alterra & Pravada at Grossmont Station in La Mesa, CA. "High-density, transit oriented development such as Alterra & Pravada is an example of smart growth and sustainability principles that promote housing affordability and reduce traffic congestion on our streets and highways," said TruAmerica CEO and founder Robert E. Hart. "We continue to seek accretive investments where we can add value and generate appropriate risk adjusted returns for our investors, while at the same time contribute to the solution of quality affordable workforce housing with access to jobs, not just here in California but throughout the United States." Completed in 2010 by the seller Fairfield Grossmont Trolley LLC in partnership with the Metropolitan Transit Authority, the LEED Gold certified community features one- and two-bedroom units situated in six, four-story buildings on a high-density eight-acre site. Of the 527 units, 15% are dedicated for rent to moderate and very low housing wage earners. TruAmerica and Intercontinental will undertake a capital improvement program that will consist of a modest refresh of the nearly 10-year-old interiors as units turn, and will upgrade the common area amenities that include Alterra & Pravada's two clubhouses, two pools and pool decks. The exterior renovation program also will include new landscaping and paint to improve the overall curb appeal of the community. "Upon the execution of our business plan, residents will benefit from an upgraded living experience, complementing Alterra & Pravada's greatest amenities which are its location, walkability and commutability, setting it far apart from other properties in the competitive set," said Jessica Levin, Senior Director, Acquisitions for Intercontinental Real Estate Corporation. "We believe that this compelling combination will make this asset an excellent long-term investment for our investors." The largest of 23 transit-oriented developments (TOD) in San Diego County, the poperty is located immediately adjacent to the Grossmont Transit Center at 8727 Fletcher Parkway in La Mesa, 11 miles east of downtown San Diego. Served by the Orange and Green Lines of the San Diego Trolley and Metropolitan Transit Center bus lines, The Grossmont Traffic Center is a key trolley system transfer point providing direct routes to the region's major entertainment and employments hubs including El Cajon, Mission Valley and Downtown San Diego. Much of the success of Alterra & Pravada as a TOD is reflected in the average weekday boarding count of more than 2,600 riders at Grossmont Trolley station making it one of the heaviest used stops in San Diego County. Alterra & Pravada is also within walking distance to The Grossmont Shopping Center with more than a million square feet of retail shops and restaurants, as well Sharp Grossmont Hospital, La Mesa's largest employer. In 2012, The League of California Cities recognized Alterra & Pravada for combining many of the current smart growth points, utilizing existing infrastructure, promoting transit and providing measures for sustainability with close proximately to jobs and entertainment. With the acquisition of Alterra & Pravada, TruAmerica Multifamily's San Diego portfolio totals more than 1,600 units with assets in Oceanside, Vista, Escondido and El Cajon. This is the seventh joint venture for TruAmerica and Intercontinental, which together own more than 2,200 units in California and Washington. Kevin Mulhern, Rachel Parson, Stewart Weston and John Montakab of CBRE represented TruAmerica and Intercontinental and the seller, Fairfield Grossmont Trolley LLC in the transaction. The acquisition was leveraged with 10-year financing through Fannie Mae's preferred borrower program, Borrower Channel, arranged by CBRE's Capital Markets group led by Vice Chairman Troy Tegeler in the firm's Orange County, CA office. TruAmerica Multifamily is a vertically integrated, value-add multifamily investment firm based in Los Angeles. Founded in July 2013 as a joint venture between Robert Hart and The Guardian Life Insurance Company of America, TruAmerica has been one of the country's most active multifamily investors and manages a $7.5 billion portfolio of approximately 35,000 units across prime locations throughout Northern and Southern California, Washington, Oregon, Colorado, Arizona, Nevada, Utah, Maryland and Florida. For more information on TruAmerica Multifamily, visit http://www.truamerica.com or call (424) 325-2750. Intercontinental Real Estate Corporation is an SEC registered investment adviser with deep expertise in real estate investment, finance, development, construction management and asset management. Since 1959, Intercontinental has managed, developed, and owned over $10 billion in real estate property. Today, Intercontinental owns and manages a portfolio in excess of $7.5 billion for its clients. Intercontinental balances its portfolio both by robust property mix and by geographic diversification, while actively seeking opportunities to invest in both core and core plus, as well as value-add development projects. Visit www.Intercontinental.net for more information.